Dharamsala, May 19, 2018. 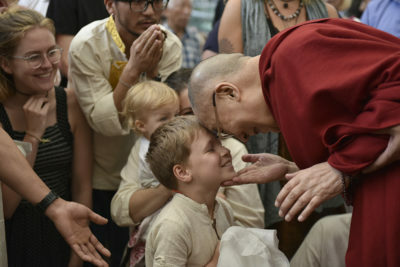 His Holiness the Dalai Lama on Saturday said the 21st century must pursue compassion, dialogue and a new system of education that inculcates moral values to its future generation. “While there could be innumerable sentient beings across the infinite galaxies, there are only 7 billion human beings on this planet. These 7 billion beings are biologically the same,” he said. “As human beings we share a fundamental wish to be happy and avoid suffering. On top of that, each of our lives are interconnected so much that a person’s future depends on the wellbeing of another”. His Holiness was addressing a group of 960 Indians and foreign tourists from 42 countries across the globe. “Wherever I go, I consider myself as one of the 7 billion human beings. This thinking makes me feel close and relate to people as brothers and sisters. 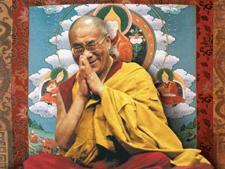 If we consider the ways in which we are all the same, the barriers between us will diminish,” His Holiness said. He further observed that compassion is hardwired in human genes and that we all have the seed of love and compassion. “Scientists have proven that basic human nature is more compassionate. Now, with the use of our intelligence, we can further develop the basic human compassion. Such a compassion empowered by intelligence and analysis can help us overcome our destructive emotions. This kind of compassion can be extended to your enemy. “Today while we are spending this moment in peace, people in Palestine, Yemen, some in South Africa are suffering. This is mainly because of our overemphasis on secondary levels of differences such as religion, race, nationalities,” he lamented. On a positive note, he said religious and societal harmony can be achieved. Hailing India’s thousand-year-old tradition of according respect to all religious faiths and culture, he said the world has much to learn from India’s ancient wisdom. “India is a shining example of religious harmony. For 3000 years, India has been home to major religious traditions and many from outside. Therefore, it is very much possible”. “Some of major discoveries in modern science, particularly in Quantum Physics and Cosmology were already mentioned in the texts of the great Indian masters thousand years ago, such as Nagarjuna, Chadrakirti and so on. Exhorting the country’s long history of logic and reasoning, His Holiness said, “I am convinced that the rich ancient Indian understanding of the workings of the mind and emotions, as well as the techniques of mental training, such as meditation, developed by Indian traditions, are of great relevance today. The ancient knowledge, viewed from a secular academic perspective, can be combined with modern education”.